Here’s a little “inside baseball” for you. The next time you go to a show at The Rrazz Room, don’t be in too big of a hurry to get to your seat. Linger in the lobby for a while until just a few moments before the show starts. 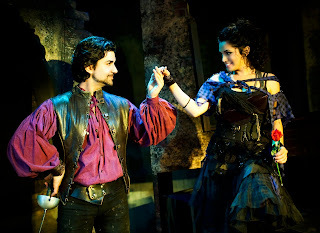 You’ll invariably be blessed by a pre-show encounter with the featured performer. Apparently, there’s no private restroom for the talent at The Rrazz Room, and they must use the same one the audience does. So, as your favorite star is heading to powder his or her nose one last time, he or she will have to pass in front of the maitre d’s station. 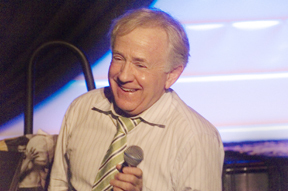 An Evening with Leslie Jordan. Last week I wrote a review for a "V"onderful San Francisco cabaret act. Her name is Katya Smirnoff Skyy and she is the best. Here's the article..
Katya… a One Night Stand: Vonderful!! Joseph Kanon (piano) and Countess Katya Smirnoff-Skyy in Katya, A One Night Stand. “We’ve known Katya since he… I mean she was a little girl,” a nice lady exclaimed as we waited in line at The Rrazz Room to see the fabulous Countess Katya Smirnoff-Skyy and her 90-minute, sold-out show, Katya... A One Night Stand. “Oh, yes,” the nice lady’s husband exclaimed, “the first time I saw him… um, her, was the day he was born.” In fact, the room that evening was filled with Katya’s devoted fans. Many knew her from her ongoing Sunday night appearances at Martuni’s Bar. And for most of the night the phrase, “We love you, Katya,” could be heard between songs from all corners of the room. The show began with Katya’s accompanist and musical director, Joseph Kanon (or, “Yo” as she affectionately calls him in her distinctive Russian accent) on the piano. Katya entered from the back of the room singing “Everything’s Coming Up Roses.” As she rounded the corner, her gracious soprano voice suddenly gave way to a rather gruff but hilarious baritone, “Get outa’ my VAY!” she snapped at an audience member whose feet were dangling in the aisle. From that moment on, the audience knew it was in for a Russian treat. Katya possesses the style and beauty one would expect of a Russian Countess. She wore a beautiful green evening gown, wonderfully adorned by her dresser Hilary Marking and designed by the gifted Mr. David. Halfway through the show she took a brief break to change into a gorgeous sequined black pants suit. Her hair was impeccable, the jewelry big and sparkly, and her nails the envy of every lady in the room.